"I was attracted by the poetry and ambition of this piece. How wonderful, and unsurprising, to discover afterwards that the author is a poet." If you travel north into the delta of Bangladesh in May, you will find yourself in the midst of a giant field of rice ready for harvesting. The districts from Bogra to Panchargarh, stretching alluvial and flat to the Indian border, are a place of heaving, hectic activity. Every person, every machine is set to only one task, and children and goats run wild and unattended as all hands are occupied ensuring there is rice to feed the families and the nation for the coming months. The day starts dusty green, stretching as far as the eye can see in the grainy morning air; clouds are low and heavy and the threat of looming monsoon rains drives people out of their homestead before dawn. Morning light creeping across the fields finds the first of them, already perspiring, swinging scythes and sickles, bundling the dew damp rice, piling and shifting the bundles. Machines are numerous, noisy and simple, but most work is done by muscle, sweat and tears. Travelling through this agricultural landscape, you step back to a simpler time, where people exert their minds and bodies for food and survival. From nearby towns come country buses carrying gangs of day labourers unprotected on their rooftops. Each man is armed with a well-worn bamboo pole or a newly sharpened sickle, prepared to work the full long day, for lunch and pay. Lean muscled torsos and limbs, in lungis and shirts and ready to sweat, ready to help get the still-green rice harvest off precious land and make space on the fertile ground for the monsoon planting. The fields, homesteads, roadsides, markets are teeming with people. Those not employed with bringing in the crop are feeding or moving or tending and repairing the tools of the harvesters. Despite the endless masses, farmers shake their heads and grumble about labour shortages and the consequent rise in the cost of a day labourer. Any child old enough to help is kept home -- allowed to feel the joy of usefulness for a day or a week. The workers are cheerful and well-fed and confidently argue their wage and their worth. The heavy wet bundles of new cut rice are carried, one spiky bundle on either end of an arched, strained bamboo pole across dark bony shoulders. The uncomfortable weight can be read in the hard fast footsteps of the labourers who carry ton after ton from the fields to the roadsides and homesteads. 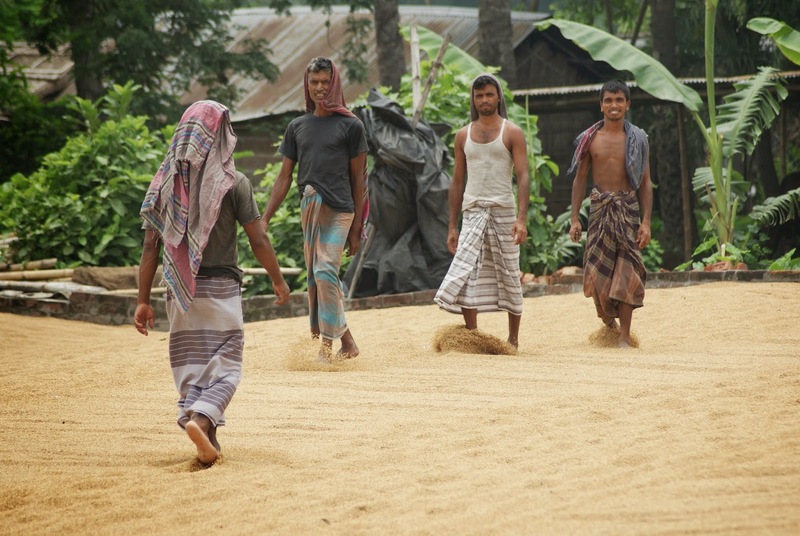 As the day progresses, the heat rises and the focus of work shifts from the fields to the roadsides, the drying floors, and the markets where rice is threshed and dried, bagged and piled, where straw is spread to breathe out its warm vapour and then bundled or thrown loose in mushroom-like mounds that sprout overnight across the landscape. After months of restraint, cows are let free to graze on the low green grass and weeds between the rice stubble. Hip bones and ribs sharply visible, with heads down and jaws moving mechanically they mow the newly harvested fields. Fresh rice is fed to threshing machines at the edge of paddies, in small yards where small families work alone or at the edge of large paddy lands where skilled workers process tons of rice ready to bag or to send for drying. The shorn straw shoots in an arc into the sky and lands ready to be spread in the sun and then stored for cattle feed. Every vehicle that can move or be moved is employed in the transport of rice-grain and straw. On rickshaw vans jute bags bulge with rice, on yellow rented trucks loads of loose straw rise so high they explode in hay puffs every time they pass a roadside tree. On homebuilt trucks, on heads and on buses, on buffalo carts the fields yield up their bounty to hungry market forces. Every flat space is put to the service of drying. Precious food for people and livestock cannot be allowed an extra day in the fields. The landscape breathes the breath of the coming monsoon and this crop must make way for the next rotation. So rice is dried on threshing floors, on canvas spread in courtyards, on rooftops, on roadsides, and even, when no other space can be found or afforded, on roads. It is tossed and turned in restless eagerness by shuffling feet, by rakes, by paddles. Bags are filled to bursting, and stitched, weighed, piled and loaded, moved to the mills for husking and boiling. The mills spew out dust and steam, and spread the boiled rice to dry again on concrete floors. As the shadows lengthen, the spread grain is piled and covered in case rain comes sneaking in the night. All day in the market hessian bags are weighed and haggled over. Hands are shaken, trucks are loaded, piles upon stacks; heaps upon mounds. Overloaded trucks make their way to the cities where eager mouths, eager hands, wait with chilies and spices to flavor the rice. In late afternoon the pace slows with the day. The heat is so ripe the approaching fruit season scents the air with sweet putrefaction. Evening light grows gentler before it fades and fields show their true worth in their golden evening glow. Ready now for the plough - for the rain - for the next crop of rice. Rilla Norslund is a poet and occasional writer living and working in Bangladesh. She is fascinated by the life of this very intense country, in which she travels as widely as possible. In this atmospheric piece, you see the colours, smell the straw, hear the haggling, feel the heat, the movement, the sweat and the toil as you are led through a busy day in the Bangladeshi countryside. Superbly evocative. Beautifully evocative, leaves the senses overloaded from simply staring at the words. Lovely piece that only a poet could bring so evocatively to life. I was there with you! Lovely post and pictures! Felt like I was there! Thanks for sharing! Descriptive and poetic piece written with great observational skills. It made me think of Thomas Hardy's scenes of harvests in rural England in the previous century. Hardy was a poet too! I can feel the heat and smell the country in this piece. Great descriptive writing. I love Rilla' writing. Even in a non-fiction piece, I read poetry.